Paul George suffered one of the most horrific leg injuries in NBA history. Do you remember Kevin Ware? Ya, it was like that. Truly awful. On Friday August 1, 2014 Paul suffered a compound fracture of his right leg during a Team USA Scrimmage in Las Vegas. His tibia and fibia broke in half when he landed awkwardly on the basket’s base after he attempted to block a James Harden layup. Geez, thanks Harden. Paul’s emergency surgery to add metal legs was successful. After missing the majority of the 2014-2015 season, he returned with a vengeance. 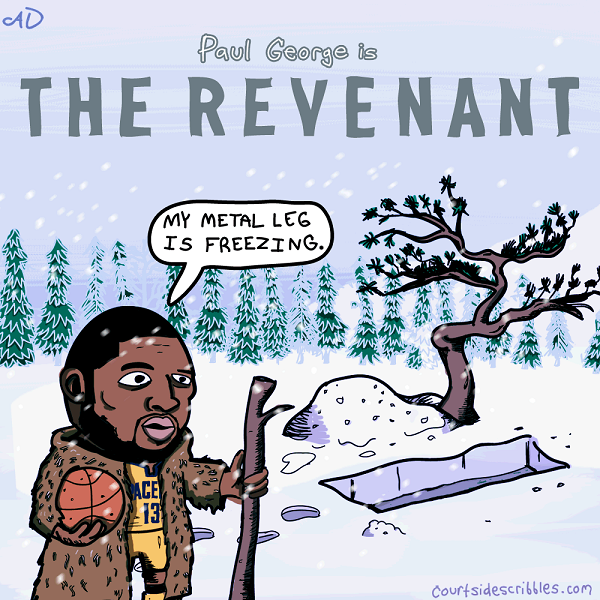 Rising from the dead on his Terminator trunks, Paul immediately averaged a career high 23.1 PPG in the return season. He hasn’t looked back since. Around the same time, the Academy Award Winning picture ‘The Revenant’ premiered with considerable buzz. Leonard Dicaprio won his first Best Actor Oscar for his portrayal of Hugh Glass. Glass was a frontiersman in early 1800s who was mauled by a grizzly bear and left for dead in remote British Columbia. Fueled by a thirst to avenge his murdered son, Glass returns to life to hunt down the killer. So yea, it’s exactly like wat happened to Paul George. What’s Up with Lebron’s Feet?